We all have a basic desire to feel love and cultivate relationships of all kinds, but above all, we hunger for a committed romantic relationship. Feeling deeply in love with another person is an immediate, heart-opening experience. I believe Synchronicity is timed so perfectly that two people who are born at a certain time, from certain parents end up making choices that lead them together. Initially, you feel deeply in love, however, even in the best circumstances, over time you may find it difficult to sustain high energy levels in your relationship because you’ve got to live life; you’ve got to raise the children and survive economically in a challenging economic climate. Consequently, at this time in history, we are experiencing a sense of being grounded in our experiences. Those who are seeking this higher connection with the greater intelligence within are being led to follow their destiny. The problem is, relationships are taking it on the chin. People are divorcing at the drop of a hat. You have relationships that are like ongoing wars. It’s a mess. One of the greatest secrets to long-term happiness in your relationship is feeling secure within yourself. As we have authentic spiritual experiences, we recognize an inner security that comes from a deep place inside. It feels like a never-ending flow of love and support. 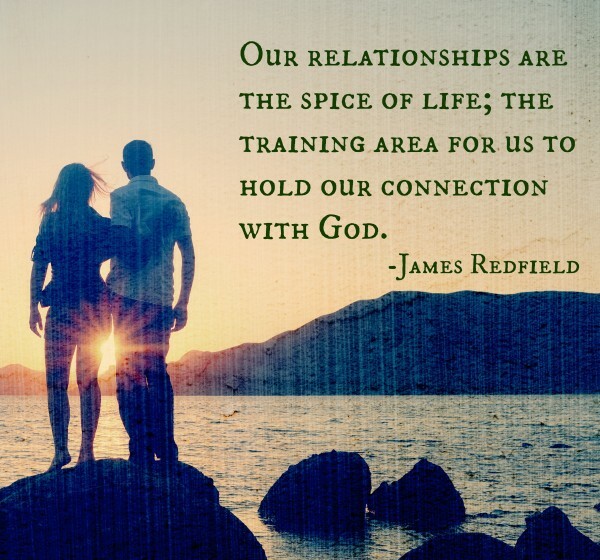 When you lose yourself in your relationship, you lose your inner connection to God’s presence. I’m talking about losing the center of your being, the peaceful, loving essence that is the main measure of spirituality. Your relationship is the joining of two hearts and two minds, but one of the stumbling blocks we face is we want to project this need for security onto another person. No other person can give us that much love, that much attention, that much anything, so we know that we have to put God first. It begins with a prayerful visualization, an affirmation that each of us can have a higher spiritual awareness and have our needs met by connecting with our truest self. When you join the experience of spirituality with the experience of loving another person, your relationship will grow in a way unimaginable. Praying together, following your Intuitions, etc.. naturally changes your point of view from self-involved to giving. To achieve real fulfillment in your relationship, ask yourself, what is the best way to enrich your partner’s experience? As this becomes the pattern, you notice how the loving, giving energy is returned back to you. The answer is, ultimately if you have a loving relationship with your partner, you CAN bridge this gap. My best advice is to listen to your partner. Do this without an agenda and see how they return the courtesy. If the heart is there, it will help make up for the problem because everyone must come to their spiritual connection in their own time. Pray that your partner will break through and find personal evidence that there is something larger guiding us. We find people are often most influenced by watching how we live and seeing the joy and security we feel.